Moving into a new business location that has an old or sun faded sign? 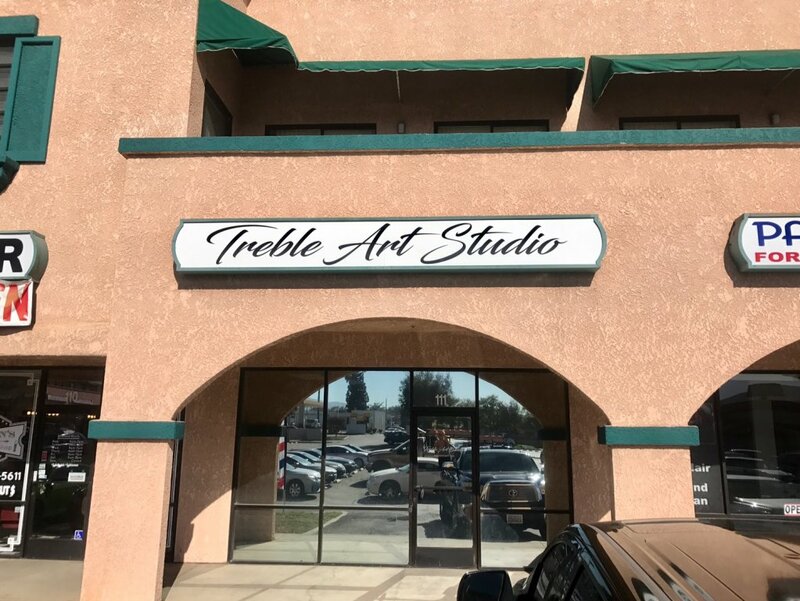 That was the case for Treble Art Studio in Corona, CA. who was in need of having the overhead lighted box sign re-faced and branded with her logo. Through the owner of the shopping plaza, she learned of the reputation of Precision Sign and Graphics and gave us a call. Let’s look at some of the steps that brought about this affordable sign refacing project. 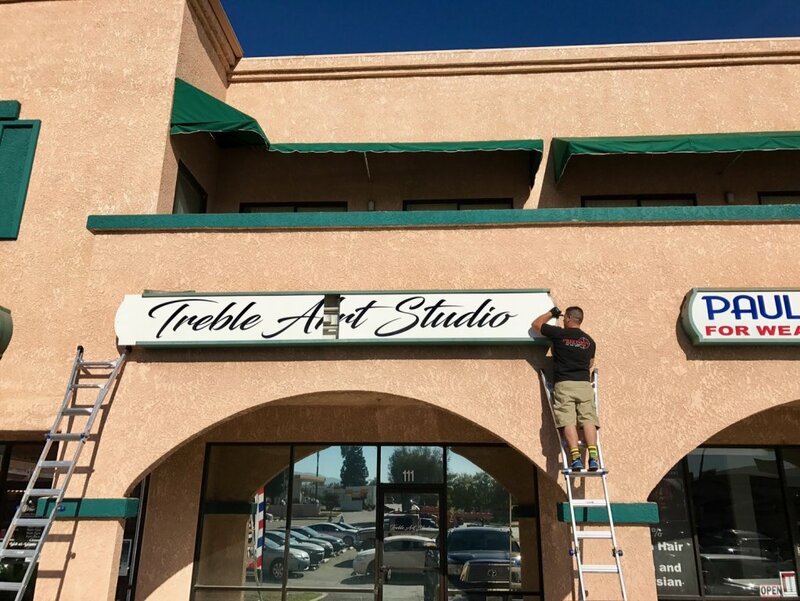 When Treble Art Studio in Corona, CA needed the acrylic, lighted box sign refaced she looked for options that would give her the best “bang for her buck”. With her particular branded logo she went looking for a sign company to size, create and install her logo for her new location; she chose Precision Signs & Graphics. Helen considered carefully the craftsmanship and quality of vinyl material that Precision has come to be known for in the Riverside and Corona CA. area. As this illuminated box sign refacing project was to be the branding focus for her new location, it was important that the quality of the sign reflected the quality reputation that she has earned within the community as well. The owner of Treble Art Studio, Helen Farber, has a long-standing business providing tattoos. Her new location in Corona will be by appointment only with an already established, large client base. With the lighted box sign in the front of their new location at 1411 Rimpau Ave. in the city of Corona, California being one of the first impressions that customers will see, close attention must be paid during the initial consultation and design. By providing examples, we were able to identify the fonts, colors, graphics and sizing needed to create the lighted box sign refacing project to Treble Art Studio’s specifications. It goes without saying that the final lighted box sign design was approved by Helen Farber at Treble Art Studio prior to material selection and installation. She was able to see a rendering of what the finished product was to look like before the installation began. Based upon the overall sign refacing specifications identified in the design we chose 3M’s 1080 series black vinyl to best suit this application. Materials were carefully hand selected based on the long term mindset we seek to fulfill with our outdoor signs. The durability and versatility of 3M’s 1080 series vinyl works well with interior/ exterior signs and window treatments. As part of the process for the 16’ x 2’ sign refacing installation, the installation crew removed and thoroughly clean the acrylic that the 3M 1080 series black vinyl was to adhere to. Diecut to the Font and script identified by the design we weeded and masked the area, measured to proportion and applied. As part of this process we also installed a custom door decal as well. Looking to Freshen Up Your Outdoor Sign? Outdoor acrylic lightbox signs can get dingy and dirty over the years. Poor quality vinyl can begin to peel, curl or just outright fade leaving a poor representation of your Riverside area business. Precision Sign and Graphics can reface that old sign and give it a fresh new look without the expense of a complete new sign assembly! Precision Sign and Graphics is a locally owned and operated sign company that utilizes the latest technology, top industry graphic design talent and state-of-the-art equipment and materials to produce our the very best product available in the Riverside, CA. area (or anywhere else for that matter). We seek to build long-term relationships with our customers by treating every customer with respect, understanding the diversity of opinions and a partnering mindset desiring to see your business succeed. 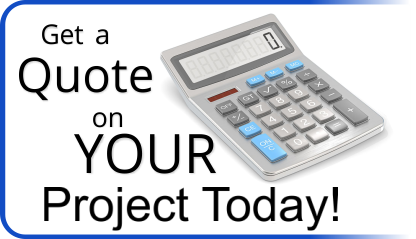 Call to let us quote your sign refacing project today! What are the different levels of vehicle graphics and wraps available?